Home About the Company Press and Media News Special TATRA trucks – Part 4: An all time longest and heaviest TATRA has been produced! Special TATRA trucks – Part 4: An all time longest and heaviest TATRA has been produced! 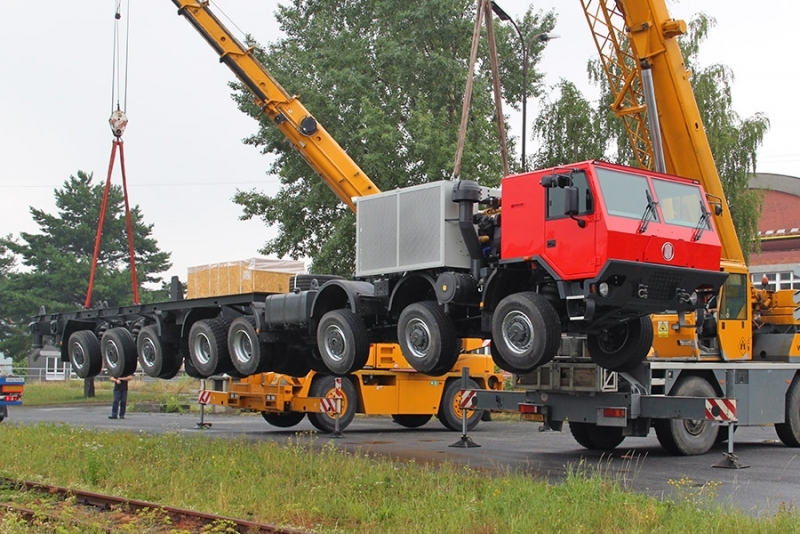 TATRA TRUCKS has completed production and shipment of the all time longest and heaviest TATRA vehicle. 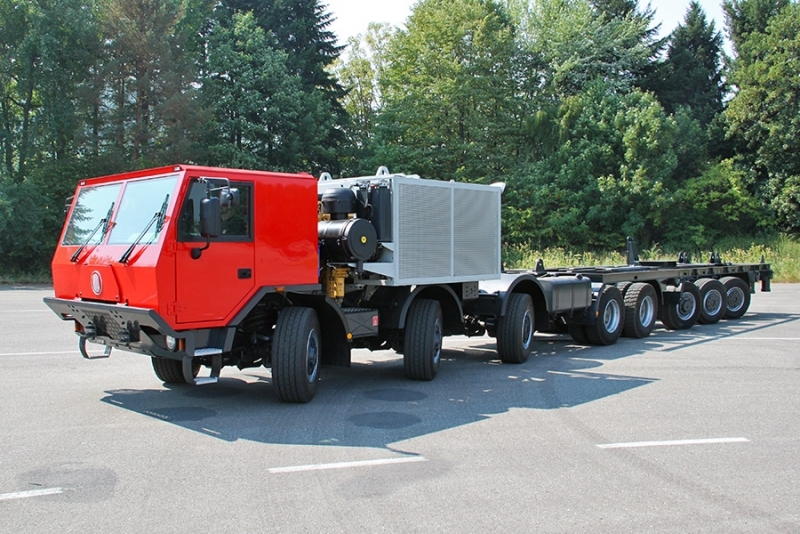 This is a chassis for special drilling rig, installed on the vehicle by German manufacturer STREICHER Drilling Technology. The vehicle will be used for exploratory drilling in difficult terrain. Gross vehicle weight of the completed vehicle is approximately 84 tons. 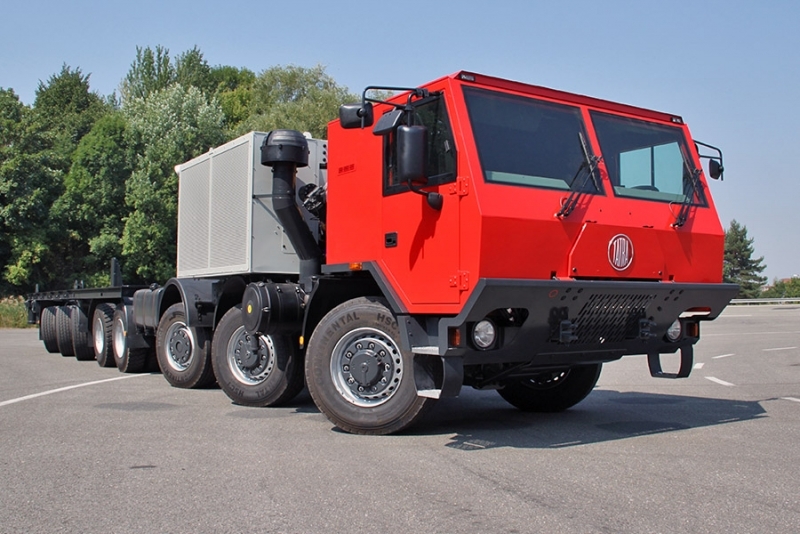 TATRA TRUCKS, along with standard trucks, special vehicles for fire brigade units and armed forces, develops and manufactures chassis for special application. From now on, even for drilling rigs, very expensive devices requiring highly customized chassis, to be reliably transported to places beyond the reach of roads in off-road conditions. 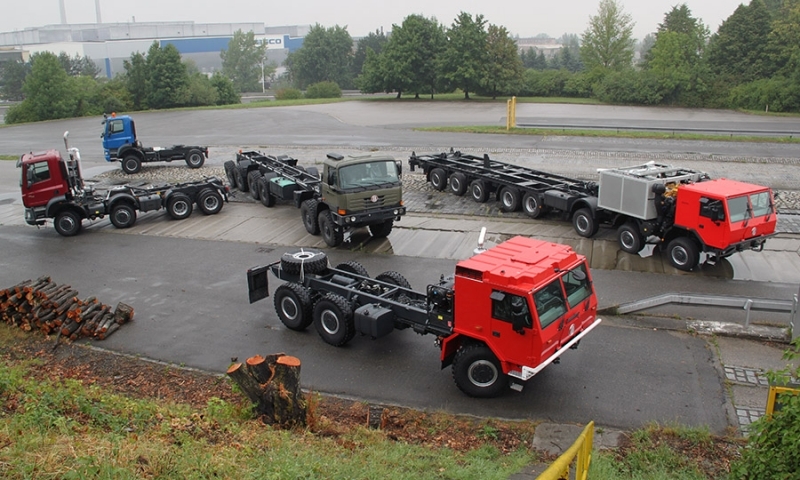 Special chassis are gaining more and more space in TATRA TRUCKS production program, more and more customers require TATRA specialized solutions according to their demands. 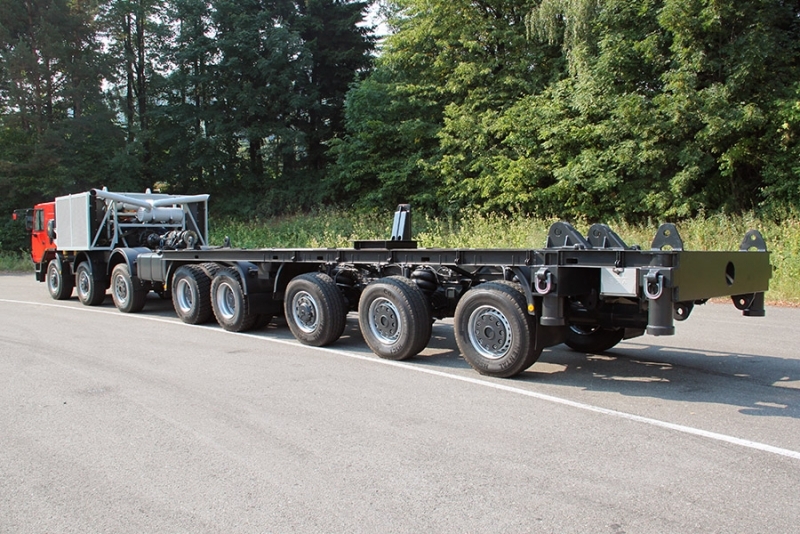 The chassis has eight axles and is configured for 16x8 drive according to customer requirements. Powertrain arrangement, however, allows, in case of interest, to put in motion all of the axels, that is 16x16. The first group of three axles is suspended by air, has a capacity of 10 tons each and all are steered. 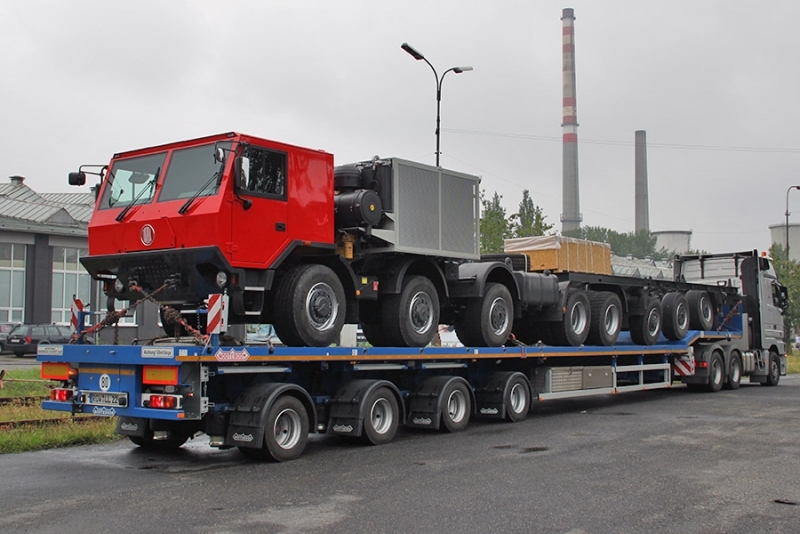 The two axles in the middle are suspended by a combination of air and leaf springs (that is heavy combined suspension) with capacity up to 16 tons each according to the used tires and the requested maximum speed (in this case is allowed a maximum load of 14.7 tons). The last group of three axles is again composed of steerable axles with air suspension and a load capacity of 10 tons each. 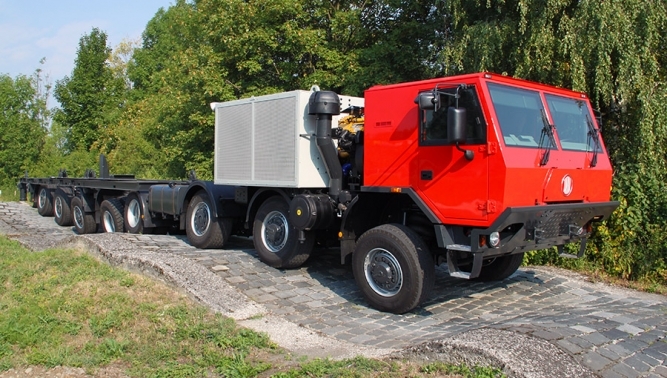 Rear axles steering is hydraulic with electronic control, produced by Dutch manufacturer VSE and linked to steering of front wheels. Wheelbases between the axles are 2 150/2 150/2 860/1 450/2 150/1 650/1 of 650 mm. On all steered axles are installed tires with size 385/65 R22,5, then on the middle tandem 315/80 R22,5. In this configuration, then, the total weight technically allowed is 86.4 tons, respectively up to 92 tons with an adequate choice of tires. The motion of this huge special vehicle is performed by 12-cylinder engine “Caterpillar C-32” with internal combustion cooling system, reaching a volume of 32 liters, an output of 839 kW/1132 hp and torque of 5143 Nm. High performance is required only for driving drilling rigs, in case of powertrain propulsion its power and torque are reduced to about a half. As a gearbox there is installed a 6-speed Allison 8610 MR gear unit with retarder. Through the universal joint drive the power is transmitted to the so-called "Distribution" auxiliary gearbox, and than can be adapted either to drilling rigs (full engine power) with exit on top of the gearbox, or to standard vehicles (reduced engine power) with exit at the bottom. Lower output is again connected through the universal joint to the second auxiliary gearbox, already integrated in the trailer, where the driving moment is distributed between the axels differentials to tires of permanently driven axles - 1st, 2nd, 4th and 5th axles. Both auxiliary transmissions are produced directly at TATRA with components already projected for standard gear and intended for production of truck series TATRA FORCE and TATRA PHOENIX. For engine cooling system, transmission and hydraulic circuits, on both sides of the vehicle, behind the cabin, are located two cooling units, each of them provided with a hydraulic ventilation system. The vehicle is completed by a standard version of the cabin TATRA FORCE with seat for driver and co-driver. This time the cabin is not folding like the ones for standard vehicles - due to the required height limit in regard to engine installation – it is moved forward 200 mm and 50 mm down. 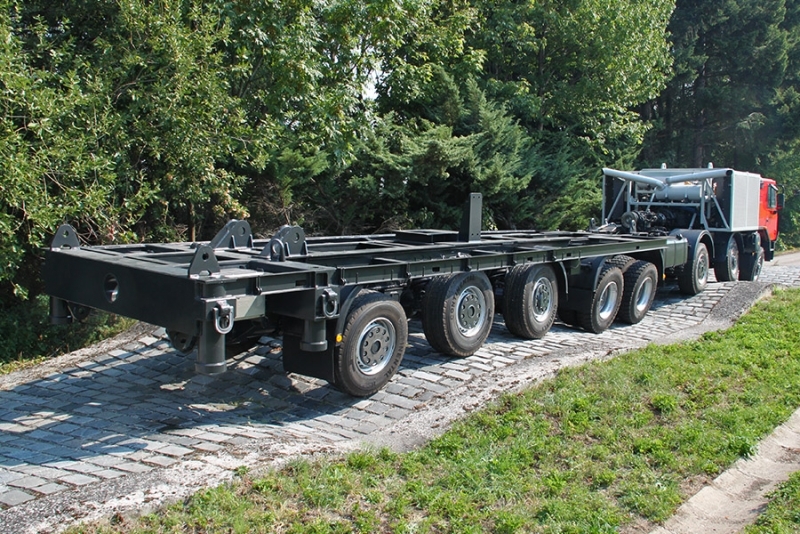 Vehicle frame is composed of two parts connected together in third axle space - the front part is produced by our company, the following unit is added by German manufacturer. The overall length of the vehicle, including frame, is 18,080 mm, height is 2490 mm and width 3000 mm. 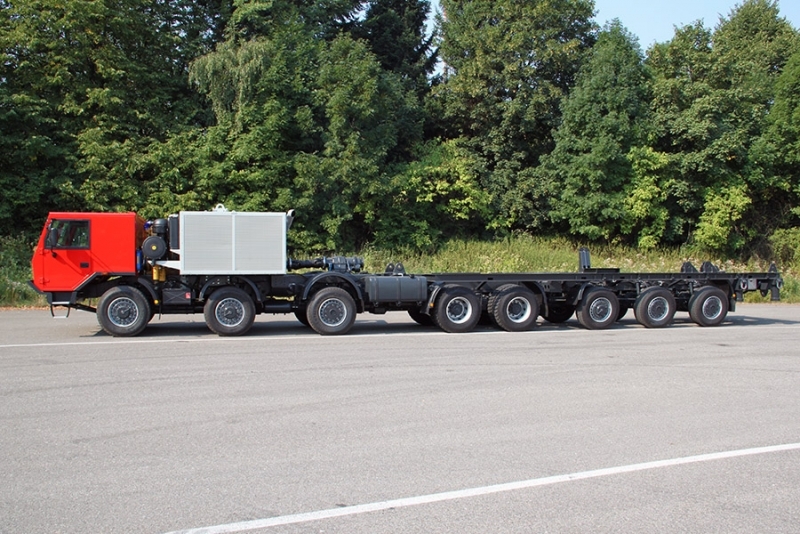 Turning radius is 15.5 m, circle radius 14.3 m.
The vehicle was, after relevant tests performed, loaded by two cranes on the trailer, transported to Germany where the superstructure will be assemled assembled.